Food and refreshments will be served. A rosary will be recited at 7PM. 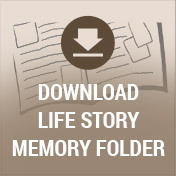 A luncheon will follow the mass at the Life Story Center - Betzler Life Story Funeral Home. 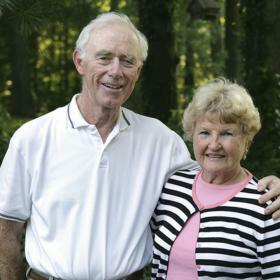 Throughout her rich and rewarding life, Delores O’Callaghan was such a blessing in the lives of those around her. She loved to laugh and had the most smiley eyes that just made her the type of person everyone wanted to know. Delores treasured her family, and there was nothing that made her more proud than becoming a grandmother and great-grandmother. Stylish and even hip, she was larger than life. Although she will be dearly missed, Delores leaves behind a timeless legacy that her loved ones will proudly carry on in her footsteps. The 1930s were some of the most trying days we have faced as a nation as the entire decade was cloaked in the hardship of the Great Depression. With a soaring unemployment rate and a two-year drought, there were few American families that didn’t feel the stress and strain of the time. Despite the trials around them, George and Cecile (Richard) Everson were able to celebrate a happy occasion in their lives as they announced the birth of the baby girl they named Mary Agnes Delores on November 11, 1930, in Detroit, Michigan. 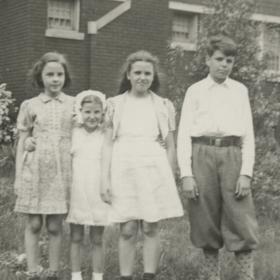 Growing up as the youngest of 11, the Everson family wasn’t immune from the challenges of the day as they had little money. Her father worked in the factory for a car company. 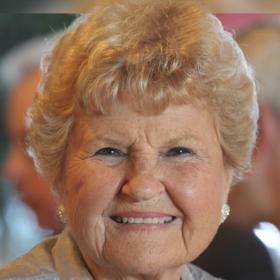 Delores attended local schools and graduated from St. Francis de Sales in 1949. Not to be forgotten during her years as a young girl was Delores’ introduction to the young man of her dreams. He was a classmate named Cornelius “Conny” O’Callaghan, and they were in the same class but didn’t know each other while in school. It was about a year after graduating that they were both horseback riding with the Catholic Youth Organization and noticed one another. Actually, Delores saw him with a pretty young girl and became a bit jealous. What she didn’t know is that the pretty girl was his cousin, but Delores really got his attention when he saw her in a car and his heart jumped. They started dating and soon found themselves in love. With a desire to spend the rest of their lives together they were married on August 1, 1953, at St. Francis de Sales. 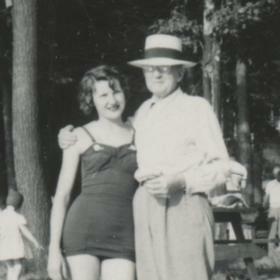 Conny borrowed his brother-in-law’s convertible Packard and went up North for their honeymoon. The young couple was as poor as church mice, but they loved their new life. Delores worked some odd jobs, but once they started their family she primarily stayed home. Together they welcomed four children including Doug, Mike, Dawn, and Kathy into their hearts and home. Her husband started his career and then enlisted in the Army, so they moved around a bit to a few different states while he was enlisted. When Delores’ husband was hired by Chrysler they moved to Royal Oak and then built a house in Pontiac. In 1962 they moved to New Orleans with her husband’s job, and they stayed there for 12 years. Delores became a beautician and did some work from her house. This was a great fit as she was always very talented and creative. Delores loved the atmosphere in New Orleans, and they loved to square dance, often with their close group of friends from Chrysler. In 1973 they returned to Michigan, first living in Redford and then moving to Plymouth. Someone who had many interests, Delores was always on the go. There was nothing better than family, and for 20 years they all got together for a week of fun in the summer with extended family. “Camp Dearborn” was a great way for everyone to get to know one another, and they were a very close family. Great friendships were made during this time amongst the campfires, sleeping on old Army cots in tents, trips out for breakfast, and so much more on these trips. Delores was an amazing hostess who looked forward to hosting the holidays every year, and her home was always beautiful for Christmas. There was holiday music, and she loved paying attention to the babies. An animal lover, Delores had dogs, cats, birds, a bunny, and even a duck she took home from the park. She and Conny loved traveling, and they even lived in Paris for three months in 1972. This was a great experience for their kids as they traveled throughout Europe. Delores taught her kids during this time and was an amazing teacher. For 20 years they spent six months living in Venice, Florida, where they had a strong community of friends. 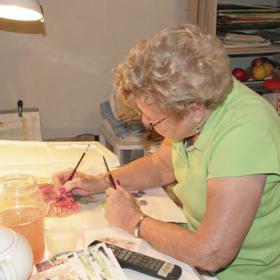 Delores took up painting with water colors while Conny golfed, and they were very active in various clubhouse activities. They always ate out, and at 5 p.m. she was in the cabana with a drink, usually a Bourbon Old Fashion. Family often came to visit, and Delores loved taking them out to see the sights. Delores and Conny were always home for Christmas, however. She loved reading cookbooks as she was an amazing cook, and anything she cooked was done the right way. Delores also loved British comedy, and she was someone who knew what she wanted. Her husband was the easy going one while she made sure things were just as she wanted them. Delores loved shopping and had an eye for fashion as she never wanted to look her age. It could be hard to keep up when shopping with her as she was a fast shopper. A caregiver at heart, Delores took fantastic care of her husband as he battled cancer.  For the past five years, Delores had been living at Friendship Village. She remained very active there even though her dementia progressed. Delores made many friends there. With a life that spanned times of great change in the world around her, Delores O’Callaghan was truly beautiful on the inside and out. She could be a bit feisty as she was someone who knew what she liked, but she also had the biggest heart. Delores loved to laugh, and her zest for life was contagious to all who were near. Dearly loved, she will be forever missed. Delores O’Callaghan, of Kalamazoo, died November 9, 2018, at Woodside, Friendship Village. Surviving are her husband, Conny O’Callaghan; 4 children: Doug (Terri), Mike (Margaret) O’Callaghan, Dawn (Dennis) Huczek and Kathy (Larry) Brucki; 7 grandchildren; 5 great-grandchildren; sister-in-law, Mickey Everson and many nieces and nephews. Delores was preceded in death by a grandson, Ryan and by 10 older siblings. Visit with family and friends while sharing food and refreshments on Monday from 4-7 p.m. at Betzler Life Story Funeral Home, 6080 Stadium Dr. Kalamazoo (269) 375-2900 where a rosary will be recited at 7 p.m. Mass of Christian Burial will be celebrated Tuesday 10 a.m. at St. Augustine Cathedral. A lunch will follow the mass in the Life Story Center. Cremation will take place with burial at Ft. Custer National Cemetery at a later date. Please visit Delores’ personal web page at www.betzlerfuneralhome.com, where you can archive a favorite memory or photo and sign her online guestbook before coming to the funeral home. Memorial contributions may be made to Woodside at Friendship Village in Kalamazoo.